We always knew that the fourteenth century church of St Mary, Wymeswold was special thanks to its major restoration by A.W.N. Pugin in the 1840s (see St Mary's restoration by A.W.N. Pugin). Likewise, we had long admired its array of stained glass windows and considered them to be extraordinarily fine and colourful for a relatively insignificant rural parish church. St Mary's, Wymeswold. All photographs by Ginny Westcott. Imagine our surprise when, during routine work to assess and cost repairs to the church fabric and windows in Spring 2004, we discovered the original firm that Pugin employed to install the windows. Not only is the company, John Hardman Studios of Birmingham, still operating as a world-renowned glass studio, but they have preserved extensive archives and artefacts including many of Pugin's letters and drawings and most of the original glass workshop 'day books' that contain the exact details and history for the majority of Wymeswold's church windows. Neil Phillips and Robert Martin from John Hardman paid us a visit in May 2004 to assess our windows and they were ecstatic at what they saw. They instantly identified their own windows from Pugin's time, and marvelled at the quality of the glass painting and the excellent preservation of the colours even though the critical windows were facing south, south-west and west, which is where one would expect the summer sun and winter weather to have done the worst damage over the last 160 years. These windows probably make St Mary's unique among the 'Pugin restored' Anglican parish churches in the country. St Mary's at West Tofts in Norfolk was almost completely rebuilt by Pugin but Wymeswold has far more Pugin windows (17 remain out of 18) together with all his artefacts and adornments including the original candle sconces, coronae and oak-bound bible that were produced by John Hardman in the 1840s. One of the north aisle windows in St Mary's. Born in London, March 1st 1812, Augustus Welby Northmore Pugin was the son of a French Protestant draughtsman and designer. He was not a great scholar, and contrary to popular belief, he never had a college education. However he had a precocious artistic talent for architectural design and perspective. At the age of 14 Pugin was producing fantastic drawings of European churches and cathedrals and by 1835 he was becoming well-known for his revival of Gothic designs and medieval grandeur. Pugin converted to Catholicism in this year and his work was spotted by Lord Shrewsbury for whom he worked briefly on the redesign of Alton Towers. In 1837 Lord Shrewsbury introduced Pugin to the President of Oscott College (near Birmingham) where he subsequently taught 'Ecclesiastical Art and Antiquities'. One year later Bishop Thomas Walsh received a substantial legacy and invited Pugin to design a new Catholic church, St Chad's, in Birmingham. This is when Pugin met John Hardman, a leading Catholic, metal button and medal manufacturer in Birmingham's jewellery quarter. In 1838 John Hardman junior (1811–67) started the firm of John Hardman & Co at Pugin's instigation in order to manufacture all metal fittings and adornments to beautify the churches and buildings that Pugin was involved with, including the Palace of Westminster. So every time you watched the 10 O'Clock News on ITV you were looking at a Pugin design and Hardman's products, i.e. the faces and hands of 'Big Ben'. 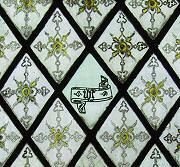 Until 1845 Pugin had been using various studios to produce his window designs in stained glass for churches and other buildings. In fact, the huge and magnificent east window in St Mary's, Wymeswold, was a design initiated by Pugin and produced by a well-recognised and renowned stained glass expert, William Wailes. However, Pugin became increasingly dissatisfied with Wailes's work and he persuaded John Hardman to set up new premises and enter into stained glass production. The first recorded reference to the stained glass project is in a letter from Pugin to Hardman written in mid-February 1845: '… I am scheming a stained glass shop – but this only between ourselves…' (The Collected Letters of A.W.N. Pugin, edited by Margaret Belcher, Vol. 2, p343, Oxford UP 2003). By the end of November 1845, Pugin and Hardman were making their first glass (first entry in 'First Glass Daybook' 24th November 1845, now in the Hardman Archive, Birmingham Reference Library), which was for St Cuthbert's College, Ushaw, County Durham. The first glass for Wymeswold, a three-light window on the South side of the baptistery, appears in the 'First Glass Daybook' on 15th December 1845. The Camden Society's influential journal, The Ecclesiologist, reported in its November 1845 issue that the quarries in the north and south windows of the chancel were to designs by John Hardman Powell (1827–95), Hardman's nephew and Pugin's sole pupil. Powell was only eighteen years old at this time, and had only recently (December 1844) come under Pugin's tutelage. His work on the Wymeswold windows is significant as being among the earliest of the executed designs of the artist who was to continue the Pugin style of church furnishings until the end of the nineteenth century, following Pugin's untimely death in 1852. The east window of the south aisle by John Hardman Powell. Pugin's eldest daughter, Anne, married John Hardman Powell in 1850. 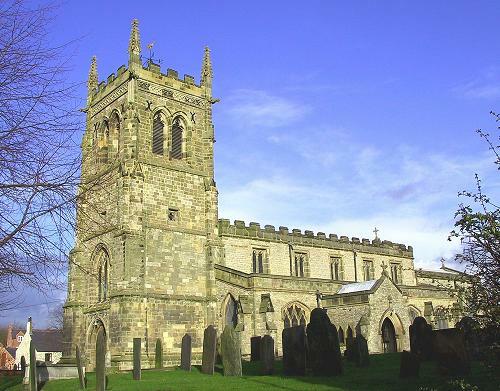 Hence, the connection with Pugin and Hardman was strengthened and still survives to this day. 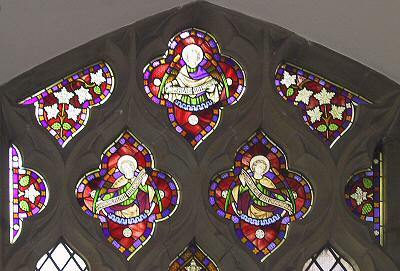 This summer John Hardman Studios began the restoration of Pugin's original Hardman and Hardman-Powell windows that have been so admired in St Mary's Church, Wymeswold. Henry Alford, a graduate of Trinity College, Cambridge, was instituted as Vicar of St Mary's, Wymeswold in 1835 only to find the medieval church in a very dilapidated condition. We do not know how Henry Alford first came to know Pugin. A distinct possibility is that they met through a mutual friend, Ambrose Phillipps, who lived at Grace Dieu Manor, not far away from Wymeswold, where Pugin was a regular visitor. What we have always known is that Pugin and Alford developed a firm friendship which endured and led to the restoration of St Mary's church. At that time the Oxford Movement was attempting to restore a sense of holiness to the Church of England on an inward and spiritual plane. The Camden Society sought to restore the beauty of holiness through the renovation and re-furnishing of old churches and the building of new ones, based on the principles of medieval architecture and design. Both movements emphasized the continuity of the Anglican Church to its medieval predecessor. The tone of the Camden Society became increasingly Anglo-Catholic, advocating the re-introduction of long-forgotten ornaments and furnishings. Henry Alford joined the Camden Society in 1844, the year in which he began the restoration at Wymeswold. Henry Alford was mostly delighted with Pugin's designs and John Hardman's work but letters between Pugin and Alford from that time suggest that the work did not always go smoothly. The east window of the north aisle was originally designed (like all the other north aisle windows) with a mixture of plain and moulded glass quarries in all of its three lights. Alford was not happy with this and commissioned Pugin to design and produce a stained glass panel for the middle light which Alford financed from his own pocket. Again, all did not go perfectly. 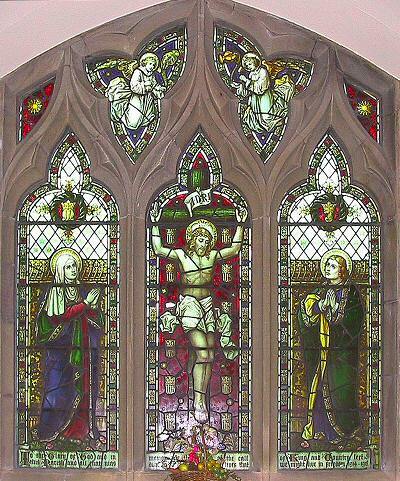 Regarding the window showing the Nativity under a canopy, and inscribed Gloria in excelsis Deo, in April 1848 Henry Alford wrote to John Hardman 'The window has arrived safe... I like it very much, all but the face of the child which is not pleasing… '. The panel that Alford requested. Tracery from the Nativity window. Although Henry Alford was personally quite rich by modern day standards and Trinity College provided him with a well-endowed benefice, his ambition for all 18 windows to sport stained glass lights was never fully realised. 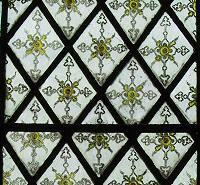 However, he did achieve many modifications and all the traceries for each of the 18 windows were in stained glass by John Hardman and produced to Pugin's designs. The tracery lights have attracted outstanding comments in their own right in terms of artistic quality and preservation. Out of 18 windows, Alford only achieved full stained glass lights in ten. However that is still an incredible achievement when one considers that today we can admire 31 fully stained glass lights, 92 exquisite large tracery stained glass lights, 16 smaller stained glass tracery lights, 2 full chancel windows of moulded quarries, and 11 panels of moulded quarries in the centre of each of the remaining plain window lights. This makes St Mary's a unique display of the glass-work produced by Pugin and Hardman's. 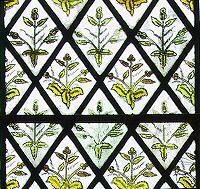 The most easterly north and south facing chancel windows are made up of pressed (moulded) glass quarries that have floral and leaf motifs. The mouldings were originally painted with oxides and then re-fired to produce yellow, black and green colourations. The firm that produced these quarries was Powell of Whitefriars in London. This Powell had no connection with Hardman, it is just a coincidence of names. However, many of you may remember (or even own) the large, brightly coloured glass vases of the 1970s that were produced in strange textured glass shapes, such as the 'drunken bricks' design. These are now fetching huge sums of money in auction rooms (and only 30 years old). That is the same Whitefriars glass firm that produced the moulded and coloured quarries in St Mary's windows back in the 1840s. Whitefriars' quarries in St Mary's. So why are these quarries worth a mention? When Neil Phillips of John Hardman Studios surveyed the windows containing these quarries in Spring 2004 he realised that in Pugin's time they had been put in the 'wrong way round'. Neil then commented that they were the best-preserved Whitefriars quarries that he had ever seen! Why? Because they were the wrong way round – the coloured mouldings being on the outside of the windows. In early- to mid-Victorian times, church attendances were higher, services were more frequent and churches were lit with many candles and latterly by gas. In those times, peoples' breath, the fumes from the candles and gas lamps, and the pollution from solid fuel heating stoves inside the churches rapidly degraded the colours in these quarries. Pugin would have been furious had he realised that the windows were installed 'back-to-front' but this mistake has done us a huge favour in terms of preservation and these very special moulded quarries will last for at least another 160 years. Other reasons for them being so well-preserved are because the critical ones have been protected from weather conditions, and sheltered by work that Pugin did building an organ chamber and extending the porches, all of which have protected the windows from the full onslaught of the English weather. The changed quarries in the western window. Many of these quarries and some of the other stained glass windows (and, incidentally, headstones and memorials) exhibit the initials 'HIS' or 'JHS'. Early (pre-1800) inscriptions could be 'IHC' or 'IHS' from Greek letters that would have spelt the single word 'iesous' or 'jesus' (the 'H' represented the Greek letter for 'E'). Later (post-1800) inscriptions are more likely to be 'JHS' because the original was changed by scholars who were, by then, more familiar with Latin than with Greek. They expanded the meaning of 'JHS' to represent the phrase 'Jesus Hominum Salvator' (Jesus Saviour of Man). The use of 'JHS' is incorrect in terms of its original Greek meaning but was probably more acceptable in the Latin context of the educational background of scholars and artisans in late Georgian and Victorian times. So, if we look at these 'JHS' or 'IHS' motifs on our windows, we are faced with an issue. Should we be able to read those initials from the outside or the inside of the church windows? During Pugin's times the debate was quite strong, due (in part) to the philosophies of the Oxford and Camden Movements. 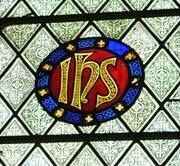 By the time that Pugin installed St Mary's windows, the lettering used for 'JHS' had been revised and so severely stylised that it could be read as the same from either side of the window. St Mary's has examples of all these styles. Yet another fascinating feature of St Mary's Church. JHS inscriptions in St Mary's windows. 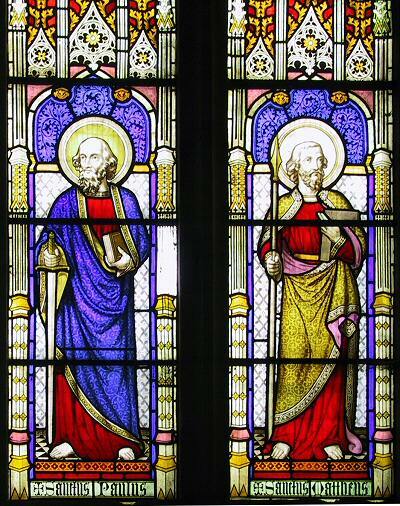 There are two more very fine, and highly applauded, windows in St Mary's that have not yet been mentioned. The finest quality of painting and the best preserved in terms of colours is the east window of the south aisle which Pugin had partly designed before his untimely death in 1852. 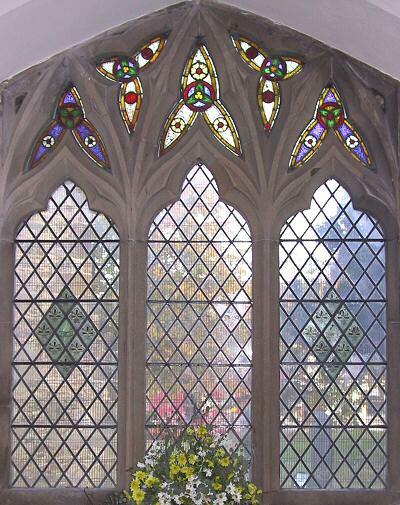 The window was completed and installed by John Hardman Powell to commemorate Henry Alford's time as Vicar of Wymeswold (1835–53) before becoming Dean of Canterbury. 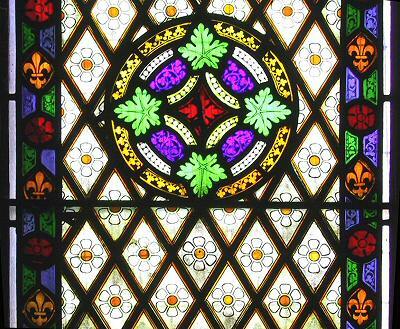 It is one of the most exquisitely painted and preserved windows that Neil Phillips and Robert Martin have seen. They also remarked on the high quality of the tracery lights above it. Two of the ten main lights in the east window. 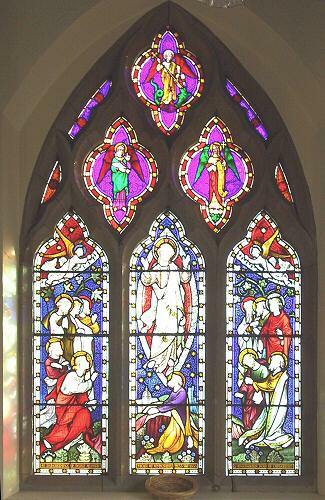 The second window not yet mentioned is the circa1920/24 memorial window for the First World War. This was designed and executed by Alexander Gascoyne of Sherwood, Nottingham. 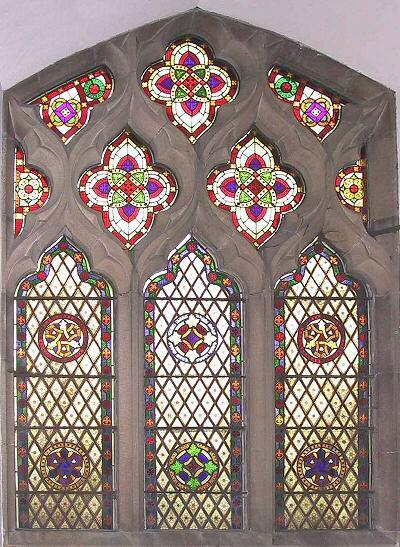 It is an early twentieth century window which replaced one of Pugin's original windows in the south aisle (the original Pugin-Hardman tracery lights that were removed are still stored in the vestry). John Hardman's experts have classified it as being one of exceptionally high quality with exceedingly fine painted tracery work. I find this window quite special because it is the only window in the entire church that has a monogram or signature by the artist. 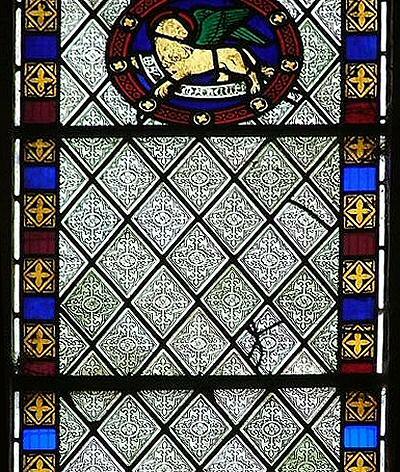 If you want to find the signatures or monograms of the original artists in stained glass windows, they will always be either in the centre of the bottom border or, as is more usual, in the bottom right hand corner of the window. The signature or monogram will mostly be a fully stained and fired small stained glass pane inserted in the border. However, few artists 'signed' all of their work. 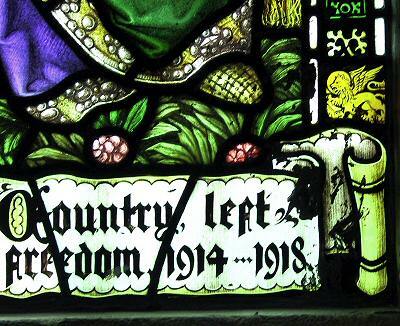 The window commemorating the First World War. The winged and nimbed golden lion monogram of Alexander Gascoyne. 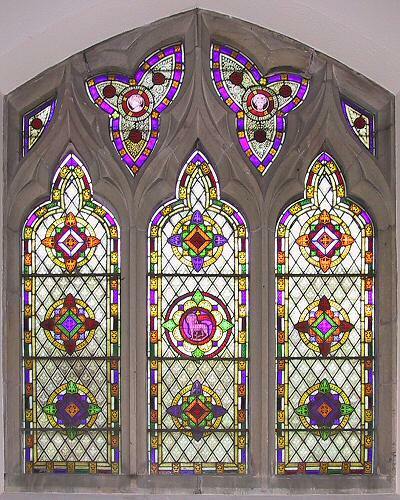 We are currently having three windows restored and plan to have another four or five done during Summer 2005. 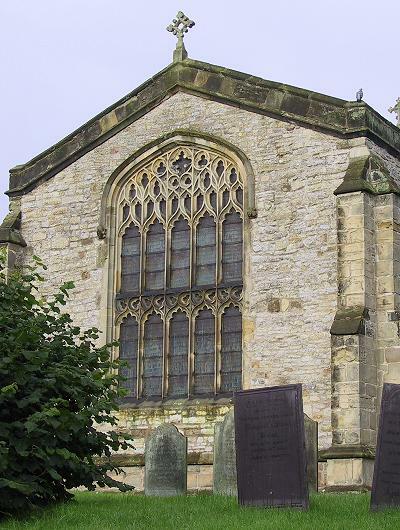 All eighteen windows, and their associated stonework, need to be restored at a total estimated cost of £120,000 over a five year period so we will be almost totally reliant on grants to help us finance this work. We already have some excellent video footage and photographs from the current restoration work being undertaken in John Hardman Studios. If all goes well with the fundraising, we hope to present an article on how stained glass windows are restored in next year's edition of The Wolds Historian. Michael Fisher, Pugin historian and archivist for John Hardman Studios, Birmingham. Neil Phillips and Robert Martin at John Hardman Studios, Birmingham. Margaret Belcher (ed. ), The Collected Letters of A.W.N. Pugin, Oxford UP Vol. 1 2001; Vol.2 2003. Brian Doolan, The Pugins and the Hardmans, Archdiocese of Birmingham Historical Commission, 2004. Stanley Shepherd, The Stained Glass of A.W.N Pugin, c.1835–1852, unpublished thesis, University of Birmingham, Vol 2. p 529–37.